The Koreans, according to the Chinese chronicles, are ‘the people who enjoy singing and dancing’ and who regaled their gods with dance and song. Since then poetry has been an essential part of Korean life and has been regarded as the highest of the arts. 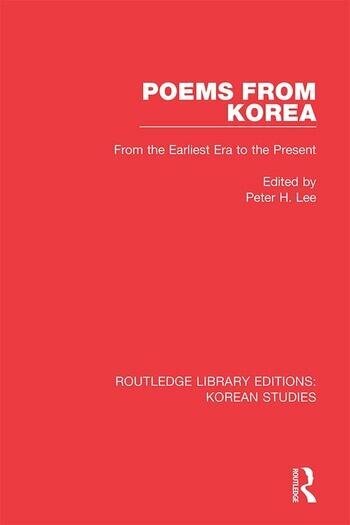 In this first comprehensive anthology of Korean poetry in English, first published in 1974, Peter Lee has selected and translated a wide variety of poems ranging from the Silla Dynasty in 57 BC to the middle of the twentieth century. The poems chosen reflect not only the native Korean tradition, but also the great tradition of Chinese poetry. They often possess a deep lyrical quality, many are rich in religious overtones or derive their beauty from contemplation of nature and through many of the poems runs the feeling of the closeness of Korean life to the earth.